The information presented by Meraki Lane Inc. is for informational and educational purposes only and should not be misconstrued as medical advice. Any opinions on medical matters presented are purely those of the authors, who do not claim to be medical professionals. For our full Disclaimer Policy, click HERE. There’s nothing worse than not being able to fall asleep or waking up constantly throughout the night. Quality sleep is an essential part of your overall health, both physically and mentally. Ongoing sleep deprivation can lead to issues such as heart disease, kidney disease, high blood sugar, anxiety, diabetes and stroke. Not everyone realizes the importance of quality sleep, but it’s just as crucial as exercise and healthy eating. If you have trouble sleeping, take a look at our best tips for how to fall asleep quickly! One of the most common things I hear people talking about is the fact that they can’t sleep because they’re thinking too much. Thinking about their jobs, their families, their relationship and everything in between. Try your best to figure out what it is that’s causing your insomnia so you can take the right steps to cut out the insomnia triggers so you can fall asleep fast(er). Sleep with Your Phone in Another Room. It’s become common to keep our phones right beside us while we sleep. We use it as our alarm and many of us check our emails and social media as soon as we wake up. But having it beside us makes it tempting to look at before we go to sleep and if we wake up during the night. The more you’re on your screen. the more your brain is stimulated and the harder it is for you to fall asleep. Too much light from your screen can affect melatonin production, signalling to your body that you’re not ready for sleep. Sleep with your phone in another room so you’re not tempted to look at it before bed and if you wake up during the night! Sleep in a Cool Room. I can never fall asleep if I feel too hot in bed and I’ve woken up numerous times during the night when I’ve felt overheated. Did you know the body’s core temperature needs to drop to initiate sleep? When you’re falling asleep your internal body temperature drops slightly and reaches its lowest point between 2 and 4 am. A bedroom temperature of 60 to 67 degrees F is ideal! Breathe in Lavender. One of the best and more unknown ways to fall asleep is to sniff lavender before bed or even scent your bedroom with lavender if you really enjoy the scent. Lavender helps you relax, can lower your blood pressure, and helps clear your mind. Breathe in the scent of lavender before bed to help you sleep deeper and wake up more invigorated. Stick to a Regular Sleep Schedule. A regular sleep schedule is key to beating insomnia. If you tend to always go to bed at different times, this can really mess up your sleep cycle. It’s best for your biological clock if you go to bed and wake up at the same time each day, including weekends. Some people like to sleep in later on the weekends, but doing that can make your insomnia worse. Use Your Bedroom Only for Sleeping. It’s important for your mind and body to associate your bedroom with sleep. If you work from home or bring work home, don’t do it in your bedroom. If you do, your mind will associate it with work and keep your wheels turning. It’s also best not to watch TV or do anything that stimulates your mind – keep your bedroom for sleeping! Keep Clocks Out of View. One of the worst things you can do is watch the minutes go by when you’re trying to get to sleep. The more you think about how much later it’s getting, the more anxious you’ll become about not falling asleep. This also goes for waking up in the middle of the night. If you’re watching 3 o’clock turn to 4 o’clock and 4 o’clock turn to 5 o’clock, you’re going to feel even more stressed out. Stay Out of Your Head. This one’s easier said than done, but do your best not to think about everything under the sun when you go to bed. And most importantly, try not to think about the fact that you can’t fall asleep. Work on relaxation techniques such as deep breathing and yoga to get you into a relaxed state instead. Read a Book. Reading a book before you go to bed can help take your mind off of daily stressors and will help you relax. Try to go to bed half an hour earlier than you usually do to get some reading in. If you wake up in the middle of the night and are awake for more than 20 minutes, use a dim light and read a book to help you get back to sleep. Practice Meditation Before Bed. Meditation can bring your mind and body to total relaxation before bed, and help you get to sleep faster. Meditation helps enhance melatonin levels and helps the brain to achieve a sleepy state. It will be easier to fall asleep and you’ll wake up feeling more energized. Avoid Long Daytime Naps. If you’re not getting a good night’s sleep it’s typical to feel tired during the day, but try to skip naps if you can. Long naps (over 20-30 minutes) especially, can make it more difficult for you to fall asleep at night. Write Down a To-Do List Before Bed. Many people can’t get to sleep because they’re worried about what they have to do the next day. Instead of letting your to-do list float around in your mind and keep you up, write it down on a piece of paper or invest in a tool like The Productivity Planner to keep you focused during the day so you can wind down and empty your mind at night. Don’t Eat Carbs Before Bed. You shouldn’t be eating after about 8 PM, but meals high in carbs can be even worse for a good night’s sleep. If you’re going to eat a carb-filled meal for dinner, make sure to eat it at least 4 hours before you go to bed. And if you feel hungry at night, drink a glass of water instead of filling up on food. Exercise During the Day. Exercise is a great way to make yourself feel tired and help you get to sleep quickly. Exercise boosts your serotonin levels and decreases cortisol (the stress hormone) to help you get a better quality sleep. Moderate-intensity exercise seems to work best, whereas extreme and excessive exercise may lead to a poorer sleep. Don’t Drink Caffeine in the Afternoon. Drinking caffeine after 2 pm can seriously mess up your sleep cycle. Although everyone reacts differently to the effects of caffeine, it’s generally best not to drink it at least 6 hours before you sleep, and even more if you have insomnia. Try to limit coffee consumption to the morning if you can, or cut it out completely. Create a Bedtime Routine. Having the same routine every night before you go to sleep can help calm your mind, relax your body, and condition yourself to realize it’s time to go to sleep. This routine can be 15 minutes to an hour, whatever works best for you, but be consistent with it every night. Find a routine that works for you whether that includes taking a warm bath, stretching, writing in a gratitude journal, reading, writing down your to-do list or goals, or anything else that feels good. 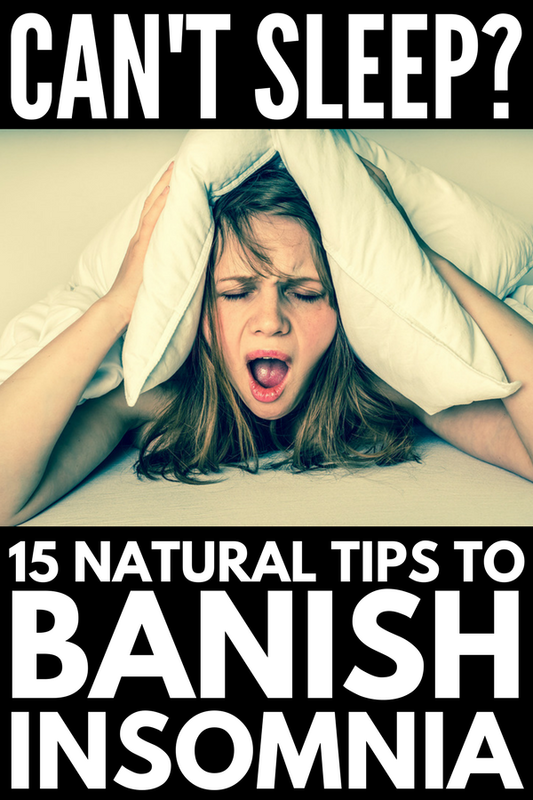 If you suffer form insomnia, try these 15 tips to get to sleep faster and wake up feeling more invigorated! If you loved these tips on how to fall asleep quickly, please share this post on Pinterest! And if you’re looking for more quality sleep tips and tricks, please follow our Health Board on Pinterest!